Under the leadership of Petr Cígler from the Institute of Organic Chemistry and Biochemistry (IOCB Prague) and Martin Hrubý from the Institute of Macromolecular Chemistry (IMC), a team of researchers has developed a revolutionary method for the easy and inexpensive production of irradiated nanodiamonds and other nanomaterials suitable for use in highly sensitive diagnostics of diseases, including various types of cancer. Their article was recently published in the scientific journal Nature Communications. Diagnosing diseases and understanding the processes that take place within cells at the molecular level require sensitive and selective diagnostic instruments. Today, scientists can monitor magnetic and electric fields in cells at a resolution of several dozen nanometers and with remarkable sensitivity thanks to crystal defects in the particles of certain inorganic materials. Nanodiamonds are a nearly ideal material for these purposes. Compared with the diamonds used in jewelry, nanodiamonds are approximately 1 million times smaller and are produced synthetically from graphite at high pressure and temperatures. A pure nanodiamond doesn't reveal much about its environment. First, its crystal lattice must be damaged under controlled conditions to create special defects, so-called nitrogen-vacancy centers, which enable optical imaging. The damage is most commonly created by irradiating nanodiamonds with fast ions in particle accelerators. These accelerated ions are capable of knocking carbon atoms out of the crystal lattice of a nanodiamond, leaving behind holes known as vacancies, which at high temperatures pair with nitrogen atoms present in the crystal as contaminants. The newly formed nitrogen-vacancy centers are a source of observable fluorescence, which gives nanodiamonds great potential for applications in medicine and technology. A fundamental restriction to the use of these materials on a broader scale, however, is the great cost and poor efficiency of irradiating ions in an accelerator, which prevents the generation of this exceptionally valuable material in larger quantities. The scientists headed by Petr Cígler and Martin Hrubý recently published an article in the journal Nature Communications describing an entirely new method of irradiating nanocrystals. In place of costly and time-consuming irradiation in an accelerator, the scientists exploited irradiation in a nuclear reactor, which is much faster and far less expensive. The scientists had to employ a trick—in the reactor, neutron irradiation splits boron atoms into very light and fast ions of helium and lithium. 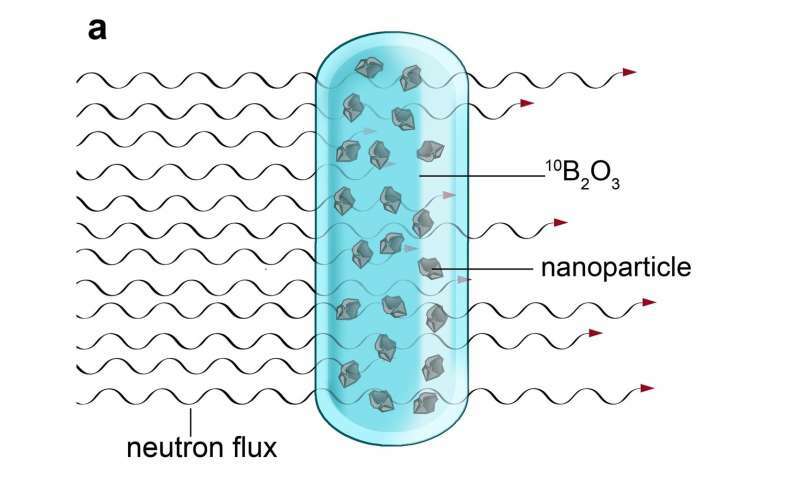 The nanocrystals must first be dispersed in molten boron oxide and then subjected to neutron irradiation in a nuclear reactor. 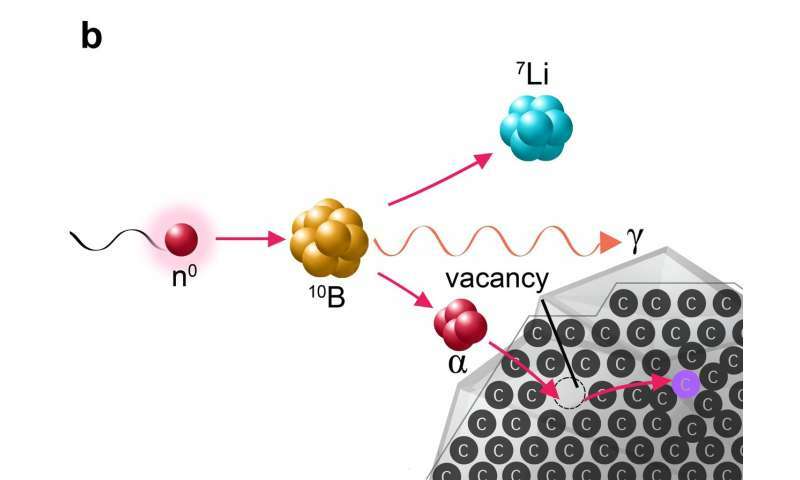 Neutron capture by boron nuclei produces a dense shower of helium and lithium ions, which have the same effect within the nanocrystals as the ions produced in an accelerator: the controlled creation of crystal defects. The high density of this particle shower and the use of a reactor to irradiate a much larger quantity of material means that it is easier and far more affordable to produce dozens of grams of rare nanomaterial at once, which is approximately 1000 times more than scientists have thus far been able to obtain through comparable irradiation in accelerators. The method has proven successful not only in the creation of defects in the lattices of nanodiamonds, but of another nanomaterial as well—silicon carbide. For this reason, scientists believe that the method could find universal application in the large-scale production of nanoparticles with defined defects. The new method utilizes the principle applied in boron neutron capture therapy (BNCT), in which patients are administered a boron compound. Once the compound has collected in the tumor, the patient receives radiation therapy with neutrons, which splits the boron nuclei into ions of helium and lithium. These then destroy the tumor cells in which the boron has collected. This principle taken from experimental cancer treatment thus has opened the door to the efficient production of nanomaterials with exceptional potential for applications in, among other areas, cancer diagnostics.